SKÖVDE, Sweden – March 22, 2016 – Pieces Interactive today revealed that Kill to Collect, an 80’s cyberpunk rogue-like with up to four-player online co-op, will be launching on Steam on April 6, 2016. A brand new gameplay trailer also accompanies the launch date announcement, showing off a glimpse of its exciting upcoming in-game features and its challenging strategic action. The game will launch on Steam at a temporary discount of $14.99, with unlimited online co-op gameplay for no additional cost. Kill to Collect delivers fast-paced, intense runs that use procedurally generated maps and enemies to keep players on their toes. In this challenging game where timing and placement is key, every interaction matters when trying to outsmart your foes to survive the depths of the dystopian Geoshelter Alpha. In Kill to Collect, players will take up the role of the “Hunters”, hired contract killers that will carry out any task for the right price. Navigating Geoshelter Alpha, Hunters must keep their wits about them to endure the harsh, lawless slums of the Deeper Levels, overrun by corrupt megacorps and criminal degenerates. 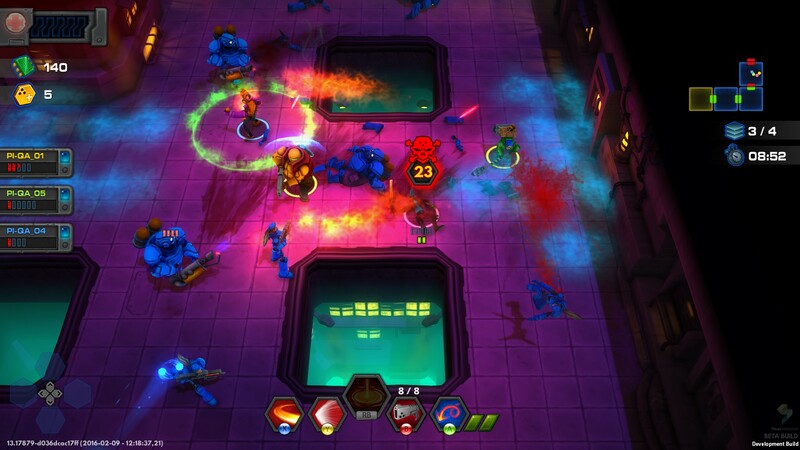 With four unique Hunters to choose from, players can take down their bounties with swift swords, iron fists, riot guns, or even electrocution. The three different game modes and variety of weapons to discover also help keep each run fresh and exciting. The game’s online cooperative mode also enables players to work with up to three other Hunters when completing bounties. Though dying is frequent and an integral part of gameplay, especially in single player, team synergization and revives are available when playing with friends. Drawing thematic inspiration from 80’s classics like Ghost in the Shell, Kill to Collect creates a dystopian, cyberpunk world, complete with a synthwave soundtrack. For more information about Kill to Collect and Pieces Interactive, please visit www.killtocollect.com. Like the Pieces Interactive Facebook page at www.facebook.com/piecesinteractive or follow on Twitter @PiecesInt for additional updates. Download related press assets here.